the Mother's Day project to make sure YOU aren’t an invisible part of their childhood. Celebrate Mother's creates beautiful artwork of a busy mom and her children, so she can look back when her children have grown and not regret that she was always behind the camera. The imagery is mixed with her hand-written words answering, “what do you want to remember most about your children at the age they are right now?” And the words or drawings of her children answering, “what do you love most about your mom? This year we only have 3 dates open for sessions. 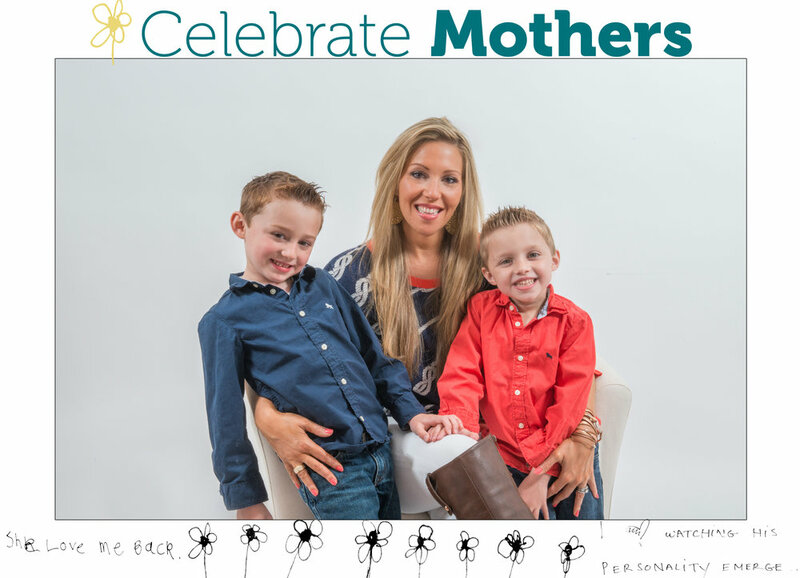 Be sure to book your Celebrate Mother's Session before all of the spots are gone. ● Heartwarming question & answer pages so you can remember what was most important to you about your children during this time of your life, and can feel how much your kids appreciate you with their answers. * $127 is the session retainer. You can see our available session dates and times and reserve your session at this link. You will need to fill out the “day/time” in the empty box, and check out with a credit card. It is a collage of you and your child/children’s answers from the session. We scan the documents and put them in a collage with our favorite image from the session. This 8x10 is heartwarming, and really what the session is all about! Because we have such a limited time frame for these portraits, the session retainer is non-refundable. If we have more available dates specific to the Celebrate Mother’s sessions, we can reschedule as long as you give us at least 48 hours notice. No-shows forfeit the entire session retainer. Anybody more than 5 minutes late for their session will forfeit their session retainer. Absolutely! Just go through the checkout process and book at this link, using your own information. After you successfully purchase the session, pop me an email at YourEmailAddress.com letting me know you are using this as a gift. At that point I’ll mail you a certificate you can give as a gift. You can email or call us about a traditional portrait session if you would like a complete set of family portraits with your husband or partner. These sessions also include portraits of your children together, individuals of your children, and you and your partner. What safer beauty looks like + FREEBIE alert!